The ‘Syn-ket’ (or ‘Synthesiser-Ketoff’). Paolo Ketoff & John Eaton, Italy. 1963. 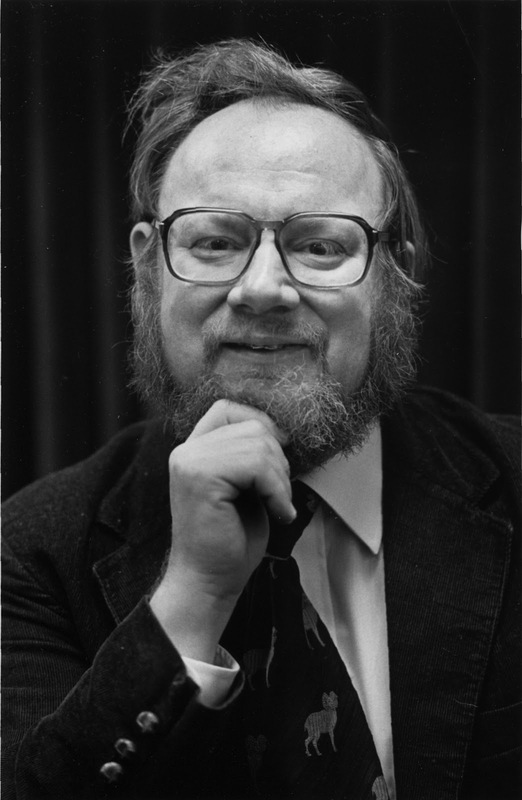 With the debut of affordable transistors in the late 1950s, several electronic engineers, inspired by the ideas of Harald Bode, realised the potential for creating lightweight, affordable and durable electronic instruments. Bode’s proposal for voltage controlled transistor based instruments ( “European Electronic Music Instrument Design”, Journal of the Audio Engineering Society (JAES) ix (1961): 267) inspired Robert Moog, Donald Buchla and Paul Ketoff amongst others to put Bode’s ideas into practice. Paul Ketoff was an American- Polish-Italian sound engineer working for RCA based at the Cinecittà film studios in Rome. 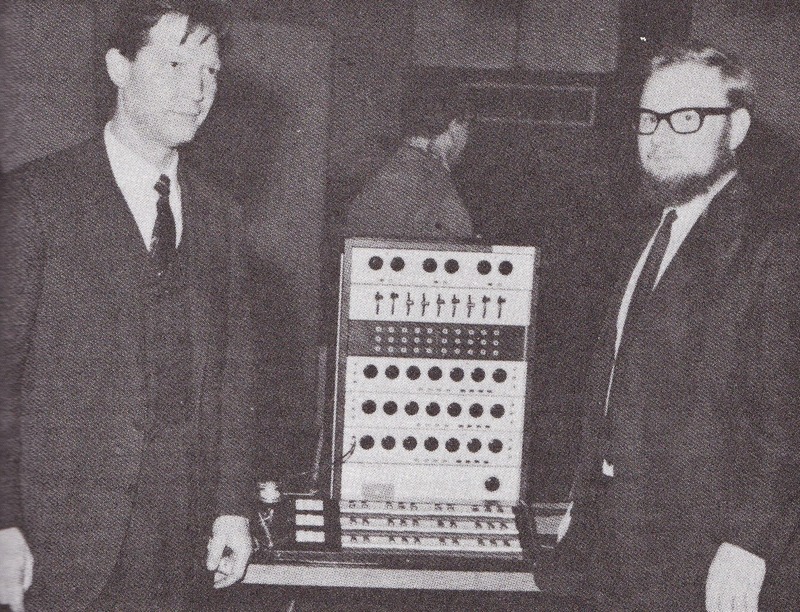 In the summer of 1956, Ketoff was invited by the composers Otto Leuning and George Balch Wilson to design a new electronic music studio at the American Academy in Rome– Otto Leuning was the composer in residence at the Academy and organised finance for the project via Columbia Princeton’s Alice M. Ditson fund. Ketoff built a tape-based studio in the basement of the Academy at Via Angelo Masina (comprising of: three sine wave oscillators, a spring reverberation unit, a microphone, an Ampex stereo portable tape recorder,a mixing console, 350 Series Ampex mono tape recorder and a radio/record player) and then went on to develop the ‘Fonosynth’ in 1958; a large studio synthesiser with musical direction from Leuning, Gino Marinuzzi jr and other composers at the academy. Inspired by Harald Bode‘s ideas proposed in the 1961 JAES Journal, Paul Ketoff designed a new, much smaller, voltage controlled transistor based synthesiser to replace the Fonosynth (and again, indirectly funded by Colombia Princeton). Ketoff presented his new instrument christened the ‘Syn–Ket’ (Synthesiser-Ketoff) to the American composer John Eaton at the American Academy, who quickly recognised the possibilities of using the synthesiser for live performances; that is, performances without any tape recorders – electronic music performances of that period usually relied on recorded sound because ‘synthesisers’ were huge, stationary, multi component, studio based devices and far too big to move to a live performance space. Paul Ketoff (right) and John Eaton (playing) performing with the Syn-Ket in Italy, 1963. 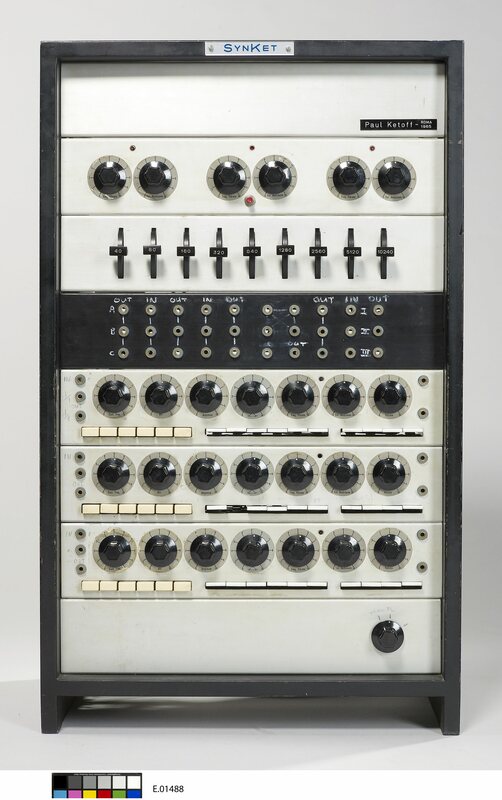 The Syn-ket comprised of three sound modules or “sound-combiner” as Ketoff called them – essentially three separate synthesisers built using a mix of solid state and vacuum technology. 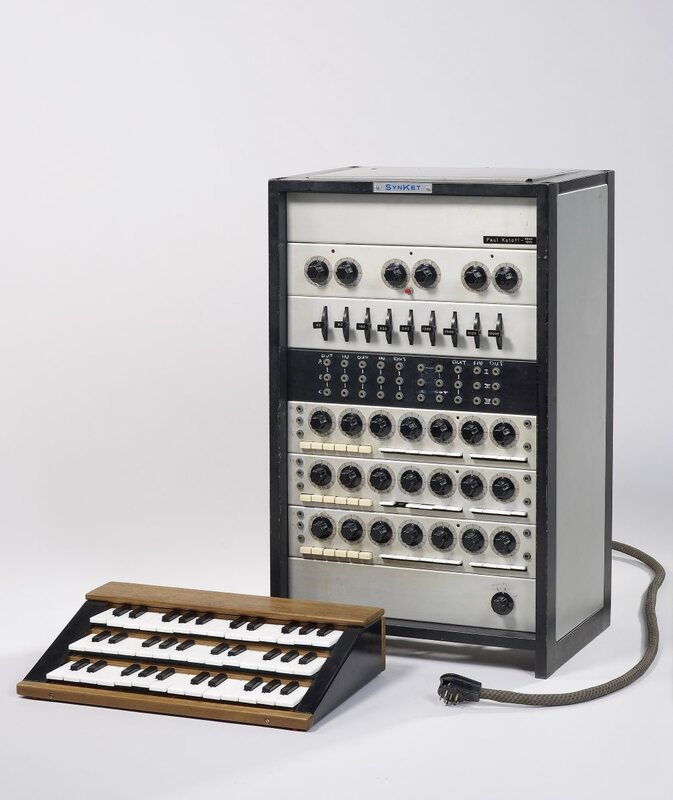 Each module was independently controllable and interconnectable and mixable into a single output. 1 square wave frequency-controllable oscillator. 3 complex filters with a frequency range of 40 Hz – 20 kHz. 3 modulators each controlled by a low frequency oscillator: The first allowed control of the square wave oscillator’s frequency, The second controlled the frequency of the filter and the third controlled audio amplitude. Later versions were equipped with white and pink noise generators and a spring reverberation unit. The Syn-ket was equipped with three small two octave keyboards, each corresponding to a module. Each key could be individually tuned allowing the musician to play and compose microtonal music. The keyboard was velocity sensitive and uniquely allowed the player to bend the note with a sideways finger action. The second version of the Synket allowed the player to control amplitude and filters through key velocity. 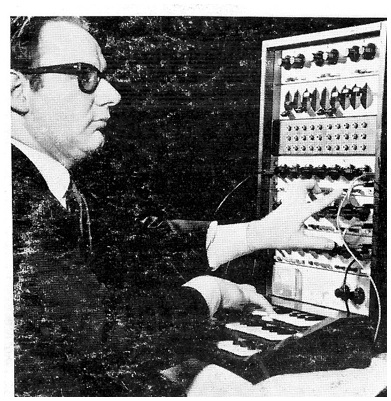 The Syn-ket was adopted by John Eaton as his concert instrument and he made over a thousand performances from 1966 to 1974 and used the Syn-ket in several of his recorded compositions, such as “Piece concert is Synket and Symphony Orchestra” (1967), “Blind Mans Cry” (1960), “Mass” (1970). The Syn–ket was not conceived as a commercial product – Ketoff built only about a dozen variations on the Syn-ket theme between 1963 and 1977 – and notwithstanding it’s innovative and unique features remained a one-off custom made instrument. Despite this, the Syn-ket was widely used by composers other than Eaton and found itself almost ubiquitous on Cinecittà soundtracks for Spaghetti westerns (Ennio Morricone used the Syn-ket on many of his soundtrack scores ), Italian horror and science fiction films. One of the few surviving Syn-kets can be seen at the Philharmonie de Paris (previously know as the ‘musical instrument museum’) Paris, France. Biographical Notes Paul Ketoff/Paolo Ketoff. Polish-Italian Electronic and sound engineer. Born 1921 died 1996. 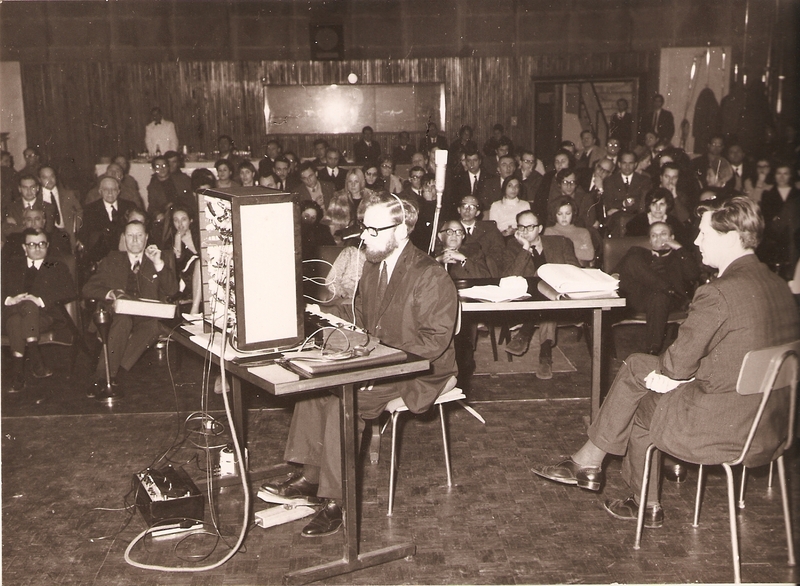 Ketoff became the chief sound technician at RCA Italiana/Cinecittà film studios, Roma, in 1964 and the Fonolux post production company, between 1957 and 1965. Ketoff designed many devices for film music production including dynamic sound compressors and ring modulators, reverb chambers and plates, and established a new standard of sound post-production. Ketoff was a lifelong friend and collaborator with the Italian composer Gino Marinuzzi jr. Paolo Ketoff was married to Landa Ketoff, the well known musical critic for La Repubblica Newspaper. The composer John Eaton began his musical career as a child, taking piano lessons at the age of nine and his first concert, playing Beethoven sonatas. In 1957, at age 22. Eaton graduated in Princeton University. In 1959 he moved to Rome (Italy) and lived there in the following years. There he began a long time partnership with clarinetist Bill Smith – Their band recorded two albums and made several concerts in Europe and in the United States. 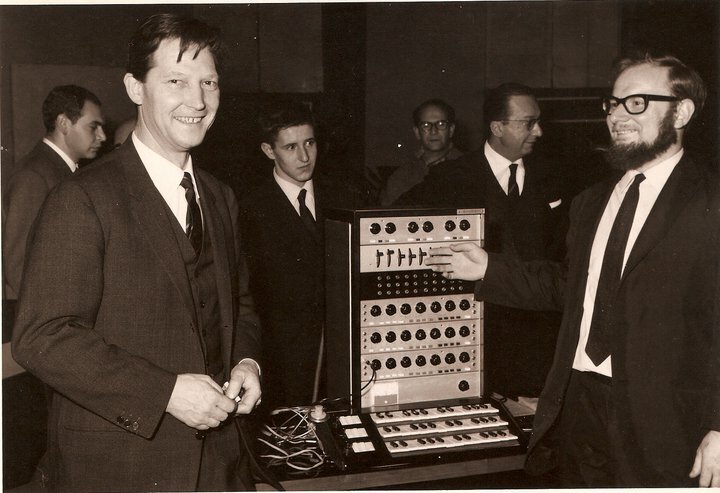 In Rome John Eaton met the electronic engineer Paul Ketoff, inventor of the famous and legendary Syn-Ket, in 1964. With the Syn-Ket, John Eaton performed more than a thousand concerts around the world. Eaton later collaborated with Robert Moog to develop the ‘Eaton-Moog Multiple-Touch Sensitive Keyboard’. ‘Music and Musical Composition at the American Academy in Rome’. Martin Brody. University of Rochester Press. 2014. Thanks for your comment – fixed! Again, congrats on such an amazing website…my students and I refer to it often. Sadly, you may update John Eaton’s dates on this page to “died December 2, 2015.” We have a Syn-ket at Indiana University where John taught and are looking into restoring it. Alas, its three-tiered keyboard was sent to Italy during John’s life for repair and never returned, current whereabouts unknown.